Planting Dates: For spring, plant seeds 2-4 weeks before the last average frost. For fall, 8-10 weeks before the first average frost. For best production use a succession of plantings. In general, February 7 - March 15, August 10 - September 30. Planting Method: Broadcast seed or plant in rows on top of the soil. Seeds need light to germinate. When the seedlings have 2-3 leaves, thin to 2 inches on center, later thin to 8-10 inches. The small plants that are removed are excellent for use in salads, or eat them fresh in the garden, if you are a grazer like me. Lettuc seed can’t emerge through the slightest crust. Seed Emergence: 3-10 days in soil temperatures ranging from 40-85°. 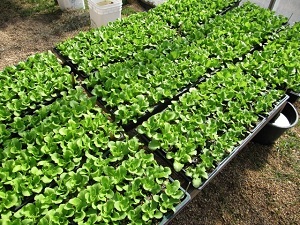 Lettuce will germinate as low as 35°. Growth Habits: Leafy, cool-season vegetable. For the best quality, lettuce needs to mature during cool temperatures. Culture: Thrives in healthy soil. Use lots of compost, rock powders, soft rock phosphate, and organic fertilizers. Soil moisture is also important. Avoid having lettuce mature in hot weather to avoid bitterness and bolting. Lettuce and carrot seeds are the most difficult seeds to sprout. The slightest crust will stop them. Troubles & Solutions: Cutworms, loopers, and imported cabbage worms can be controlled with Bt products or the release of trichogramma wasps. For aphid, spray Garrett Juice or molasses water and release lady beetles. Slugs, snails, flea beetles, and garden flea hoppers can be controlled with garlic/pepper tea, citrus products, or neem products. Harvest and Storage: Harvest small thinning plants any time. Harvest leaves before they mature. Lettuce can be cut and allowed to grow again. Cut leaves can be stored at 32-40° for 1-3 weeks. Notes: A high source of silica. The leaf-type lettuces are the easiest to grow. Different types include leaf lettuce, butterhead, romaine, and iceburg.